High volume (a few thousand distinct metrics updating every minute) pretty much requires a good RAID array and/or SSDs. Graphite’s backend caches incoming data if the disks cannot keep up with the large number of small write operations that occur (each data point is only a few bytes, but most standard disks cannot do more than a few thousand I/O operations per second, even if they are tiny). 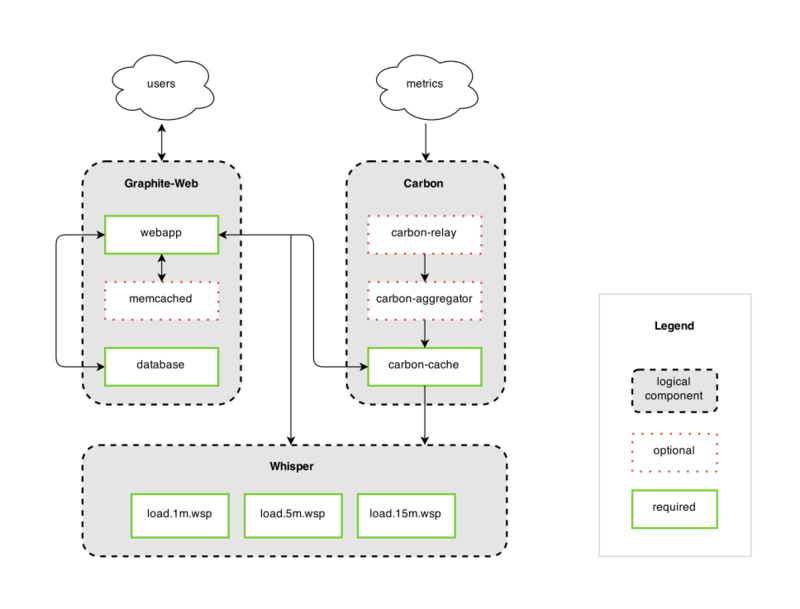 When this occurs, Graphite’s database engine, whisper, allows carbon to write multiple data points at once, thus increasing overall throughput only at the cost of keeping excess data cached in memory until it can be written. Graphite also supports alternative storage backends which can greatly change these characteristics. The second reason whisper was written is performance. RRDtool is very fast; in fact it is much faster than whisper. But the problem with RRD (at the time whisper was written) was that RRD only allowed you to insert a single value into a database at a time, while whisper was written to allow the insertion of multiple data points at once, compacting them into a single write operation. This improves performance drastically under high load because Graphite operates on many many files, and with such small operations being done (write a few bytes here, a few over there, etc) the bottleneck is caused by the number of I/O operations. Consider the scenario where Graphite is receiving 100,000 distinct metric values each minute; in order to sustain that load Graphite must be able to write that many data points to disk each minute. But assume that your underlying storage can only handle 20,000 I/O operations per minute. With RRD (at the time whisper was written), there was no chance of keeping up. But with whisper, we can keep caching the incoming data until we accumulate say 10 minutes worth of data for a given metric, then instead of doing 10 I/O operations to write those 10 data points, whisper can do it in one operation. The reason I have kept mentioning “at the time whisper was written” is that RRD now supports this behavior. However Graphite will continue to use whisper as long as the first issue still exists.